This is not me. I lost our camera in the summer and am going to buy a new one very soon. Getting pictures from my I Phone onto the blog has proven to be a pain and I really want to take some great pictures to go on the blog. Coming Soon! Last week I ordered a pull up bar online and I was so excited this week when it arrived. I decided on the Ultimate Body Press because it had really good reviews and I liked the clean look of it, my gym is in the dining room after all. So it arrived and Adam installed it for me on Friday night and the whole family was fighting over who got to use it first. When it was my turn I pumped out a measly 2 chin ups and I could do 0 pull ups! Granted I had done a workout earlier in the day but I was a little disappointed in just 2 and 0. I hopped on the net to check out how to do pull ups and I was introduced to a "walk the plank" technique where you just lower yourself slowly for 8 reps in order to build strength so eventually you can achieve actual pull ups. I did a couple sets of those and then did some hanging leg circles for my core which worked amazing. The kids each did a few sets of assisted chin ups, pull ups and some hanging knee raises and Adam bless him can actually do chin ups and pull ups! One of the best things about the bar I've discovered is that it is great for stretching. My upper body was/is pretty sore from being introduced to the new exercise and I must have hung on the bar 6 different times yesterday just to stretch because it feels so good. 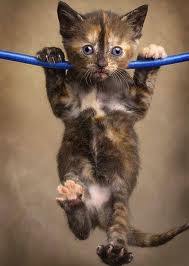 I will keep you posted on my pull up progress. I will be super pumped when I am able to do 8 straight!